How do you arrange a transit from one end of the 6.34 km long Corinth Canal to the other when you don’t have a boat? It’s a question posed on many travel forums but the answers are always vague. 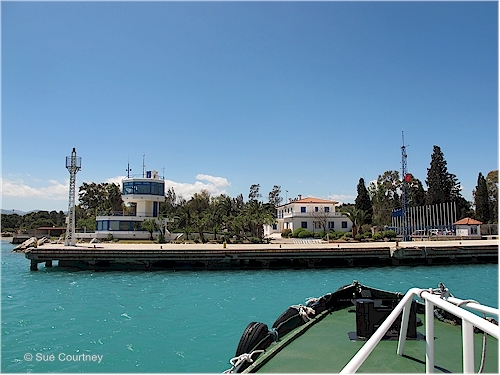 I decided I would write to the Corinth Canal Port Office hoping the email wouldn’t go into the black hole most of my wine enquiry emails had gone into. I explained I was on a homage to my father who fought with the Allies in Greece in March & April 1941 and subsequently taken POW in Kalamata and that I would be at the Corinth Canal on Tuesday the 26th April, 2016 – the 75th anniversary to the day when the German troops parachuted into Corinth and the road bridge across the canal was blown up. 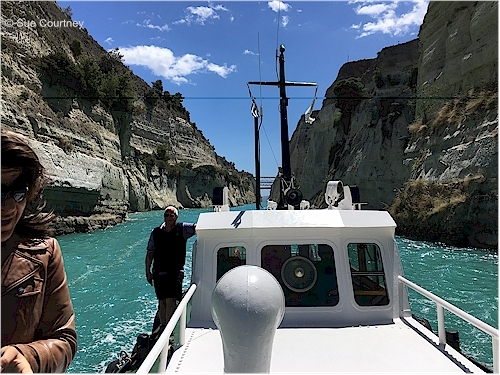 I was elated to receive a reply the very next day from Theodora Filandra, Public Relations Manager, saying that the Corinth Canal Managing Director had given his approval for a pilot boat to be available, at no charge, for my visit. Can you hear me shouting in joy from the rooftops? Now it was time to meet Theodora in person. She tells me she is interested in the WWII story (summarised here) as it was a part of the history of the canal they didn’t really know. The Corinth Canal HQ in Isthmia at the southern end of the canal has historical photos dotted around the walls including one of the Corinth Canal road bridge being blown up, but this one was taken in 1944 when the bridge that replaced the one blown up in 1941 by the Allies was detonated by the Germans. We see the damage to the canal walls in our transit later and at last I know where my Dad crossed the canal in 1941. The pilot boat is like a little tug. Just six of us on board: the pilot and co-pilot, Theodora, Tom and Rowena, and me. I felt very privileged and it was wonderful to have Tom there to share the experience with. Along the way Theordora points out historical features. The history dates back to 602 AD – there is a comprehensive article about it on the Corinth Canal’s website (click here). But it wasn’t until 1893 that the hopes and dreams from over the intervening centuries were fulfilled. The cliffs tower up to 63 metres above the water, which is 8 metres deep. The maximum width safest for navigation is 24.6 metres. Afterwards Theodora drives us to Kato Almiri about 10 kilometres south along the coast where we dine at Kalada, a beachside restaurant, for lunch. Here I am impressed with a cheese called ‘talagani’. Theodora kindly drops us back to the hotel for a much needed siesta after such a magic day. But the magic isn’t finished because Tom, Rowena and I have dinner at a seafood restaurant in Kavos simply named Kavos 1964. I have prawns in a lemon, oil and butter bisque. It is some of the best food I will eat on this trip. So as this epic day ends I realise we have been to several places starting with K, including Korinthia (Corinth) but the most important one we head to tomorrow. Kalamata. 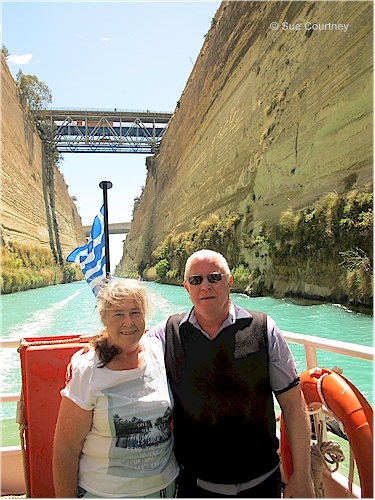 This entry was posted in Greece, Travel and tagged Corinth Canal by Sue Courtney. Bookmark the permalink.